By far the most convenient way to travel to and around Cinque Terre is by train. It is possible to approach the five villages of Cinque Terre by car, but there is no use for it once you are there as the Cinque Terre historical centres are closed to car traffic. The regional trains make stops in all local areas and are very frequent especially in the summer. Conveniently, the National Park Trust offers Cinque Terre Train Card allowing for unlimited train travel runs on the line Levanto - La Spezia - Levanto for a specified period. It is worth purchasing the Cinque Terre Card as it allows the card holder to access the hiking trails in Cinque Terre, including the Via dell'Amore (Lovers' Walk) . It also gives access to some museums, buses, elevators and other attractions. If you are traveling from Genoa which is about 130 km to the north, take a train to Levanto train station (about 2 hours), and from there take a local train connection to the five towns of Cinque Terre (about 10 minutes, make sure you purchase your Cinque Terre Card at Levanto train station). If you are traveling from La Spezia take the local train from La Spezia Centrale Station towards Sestri Levante, stopping at your destination. 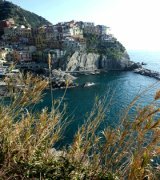 Riomaggiore is the first stop after La Spezia and is just 9 mins away. Monterosso to Levanto - 5mins . Always make sure that you validate your train ticket before traveling by train in Cinque Terre . If you have a Cinque Terre card, you only need to validate it on the day you buy it. To validate your train ticket or Cinque Terre Card by placing it into the yellow box by the train platform. The ticket will be stamped with a station name, time and date. For more information on train timetables, visit the Italian Railway portal . As we mentioned earlier, approaching the villages of in Cinque Terre by car is not advisable – they are perched on cliff tops overlooking the sea and their centres are closed for car traffic. You will find small parking facilities just above the villages of Riomaggiore and Manarola but they are both quite expensive and you can be in for quite a wait to find a parking spot in the summer. Perhaps the cheapest option is the big open parking place on the seafront in Monterosso. If you are coming from the direction of Genoa you will be travelling along the A12 route, leave the motorway at the Carrodano exit and follow signs for Levanto - Monterosso. After about 11 km turn left at the second roundabout towards in Monterosso. At the top of the hill you will drive to a short tunnel. Keep to the right for Monterosso - Fegina. If you are coming from the opposite direction, leave the motorway at Brugnato, and then proceed to Monterosso. Vernazza and Corniglia are the two most isolated of all of the Cinque Terre villages. They do not have designated touristic parking facilities and we do not recommend taking the car to visit them. They are connected to the rest of the Cinque Terre villigaes by the “sanctuary road”. 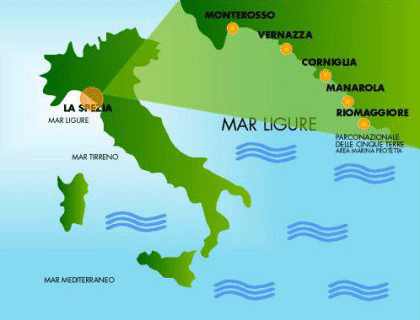 If you are coming from La Spezia, take the coastal road SP n°370, which brings you to Riomaggiore and Manarola. If you are travelling on the A12 Genova - Livorno or A15 Parma - La Spezia motorways, leave at exit La Spezia - S.Stefano Magra . Then follow directions for La Spezia and once in town proceed along the seaside finding the signs for Cinque Terre - Portovenere . At a certain point these two directions will divide: you will proceed straight up the slope in direction Manarola-Riomaggiore. The last 14 km of your journey will bring you past Riomaggiore and then to Manarola. To see images and photos of the roads leading to Cinque Terre, check our Cinque Terre Map and follow the instructions on how to use the map. Taking a boat can be an exciting way to visit Cinque Terre too and the Consorzio Marittimo Turistico 5Terre runs summer boats from La Spezia, Lerici or Portovenere to the Cinque Terre as well as excursions along the west coast to Levanto , Bonassola, Deiva Marina , Moneglia and Portofino . 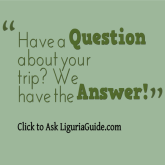 If you are arriving by plain, visit our Air Travel Liguria section for further details on directions to Cinque Terre .